The Grand Canal is the longest and oldest artifical waterway system in the world. The canal comprises 10 main sections, containing 31 groups of inscribed buildings and passing through 8 provinces. It runs along a north-south axis originating in Beijing and ending at the sea port of Ningbo. The oldest parts of the canal date back to the 5th century BC, although the various sections were finally combined during the Sui Dynasty (581-618 AD). It is considered the world's largest civil engineering project prior to the Industrial Revolution. The Chinese government used it for the unified administration of its territory and the transport of raw materials, rice to feed the people and troops. In June 2017 I made a day trip by train from Shanghai Hongqiao Railway Station to Suzhou Railway Station and then took Suzhou Rail Transit to Binhe Lu Station since it was the nearest station to the Suzhou Fengqiao Scenery Spot, one of the more scenic and easily-reachable parts of the Grand Canal of China UNESCO World Heritage SIte. From the Suzhou Fengqiao Scenery Spot, it was a 30-minute walk along a canal to the Lingering Garden, one of the Classical Gardens of Suzhou. But the best site was the plate of xiaolongxia (spicy crayfish), only available during the summer season and perhaps the most flavorful dish I've ever eaten. Site visited April 2017. I visited four inscribed sites of this WHS, three granaries and one proper stretch of the actual canal. At first, when I planned my trip to China, this site looked like just a tedious tick off. But when I searched more information about it, this site became very exciting. I found many interesting Grand Canal sites which would be very nice to visit. The only limitation would be time - which places would be within reach for my itinerary. I used Luoyang as one of my bases for my day trips so there were two options for canal visits: either Zhengzhou Section of Tongji Canal or Hua County and Xun County Section of Wei Canal (Yongji Canal). The former is nearer but it would be a bit problematic to get to because there are not any clear landmarks where to take a taxi without any Chinese skills. The latter is conveniently located along the high speed railway line towards Anyang so I would be able to visit it on my way to Yin Xu site. Additionally, I would be able to tick off one more granary site. So I chose that one. One might wonder why there are many granaries (storehouses of grain) in this kind of watery World Heritage Site. It is justified to the background that the canal is originally created for transportation of grain. The Grand Canal answered to the massive needs of agricultural empire. It solved many unbalances in society and allocation of natural resources between the different areas of the country. In the long run it became also unifying factor and means of cultural exchange to the different areas of China. So Xun County Section of Wei Canal was my choice for the first actual Grand Canal WHS visit. According to the nomination document it is ”the most typical” and ”one of the best preserved” section of the Wei Canal. Xunxian or Xun County is nice little town that has actually quite a lot of things to see. It is easy place to reach from the city of Hebi which has high speed railway station within 30 minutes train journey from Zhengzhou. From Hebi high speed railway station I took a taxi, 20-30 minutes, to Xunxian. I had printed the Chinese name of the town from Wikipedia. I showed the print to the driver and so we were heading to Xunxian. Later on I had some problems because the driver didn’t have a clue where I wanted in Xunxian so he wanted to drop me off in some modern residential area. After some negotiations and extra yuans the driver ’understood’ where I wanted to go. 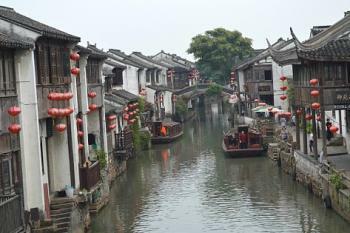 The inscribed canal section follows about three kilometres the edge of the old town of Xunxian. After that the canal continues to south about 15 kilometres towards the town of Huaxian or Hua County where the inscribed area ends. It would be possible, and also interesting, to walk all the way to Huaxian but I didn’t have time for that. 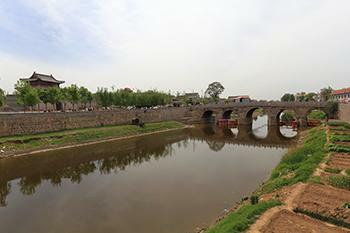 Just beside the canal is the old town wall of Xunxian or what is left of it. Along the old town the banks are made from bricks but after that the banks are earthen. It is nice to walk along the wall to the little square where is a gate to the old town. From a distance the canal looks like a picturesque place. People of the town grow vegetables on the banks and everything seem to be quite tidy. But when you get closer you can notice that the canal is very dirty and it smells bad. It is full of garbage and I even saw a dead dog floating on the water. Still there were some cheesy looking pink pedal boats to hire under the bridge. Like I mentioned, in Xunxian there are also some other interesting places to see than two Grand Canal sites. Maybe the best known attraction is the Dapi Hill on the edge of the old town with its massive 22 metres high Buddha statue which is said to be the oldest and largest in northern China. Also the adjacent Fuqiu Hill contains some ancient Buddhist relics and temples. The main streets of the old town are recently restored and in many spots there are also some remnants of old town wall and its towers. Overall, there could be some tourism potential in Xunxian. Liyang Granary is located also in Xunxian, about two kilometres from the canal. It was one of the most important and largest granaries in the Sui and Tang dynasties. It had an important strategic location between the Yellow River and Yongji Canal. One of the Liyang Granary’s significant features is the transformation from underground silos to aboveground warehouses. The site is quite easy to find from the canal. Just walk through the old town and across a bigger road. Then pass a residential area to the edge of the town. When I was, according to the map, just beside the core zone I couldn't notice anything referring to WHS. It was just a field that looked like a construction site. There were not any fences so I headed to the site via a small path. Liyang Granary is just going through a major facelift after which there should be good facilities for visitors. There were already three glass-roofed sheltering buildings for excavations and a bigger concrete building and also small entrance building. Between the buildings are wooden paths and some info signs. Otherwise, the place was under construction. Only people at the site were some construction workers but no one paid any attention to my presence. All the buildings were closed so I just watched the excavations through the glass. Hanjia Granary is the other of two Grand Canal related granary WHS in Luoyang. The site’s actual name is ’No. 160 Site of Hanjia Granary’ which means that it is just one excavated silo or cellar of former huge imperial state granary complex which is nowadays under the city of Luoyang. It is the best preserved single cellar site with the largest storage capacity. During the Eastern Han dynasty the capital city of Luoyang was the largest grain gathering place in the country. The site is located on an industrial area just beside the railway. The place was quite easy to find by using the map from the nomination document. I guess I was lucky that there was just some other group leaving when I entered the place. The guard asked me some money and let me in. After my visit he closed the place. Apparently the site is not open but on appointment. Basically the site is just one cellar, unearthed in 1972, inside a sheltering building. The cellar is 11 meters in diameter and the depth is six meters. Inside the building there are also some information signs about the granary. Huiluo Granary site is within five kilometres walking distance north east from Hanjia Granary in the suburbs of Luoyang. Busy national highway goes through the core zone. While Hanjia Granary site is just a small building, the Huiluo Granary site is quite big area with a complete granary layout and numerous cellars. On the entrance is a big stone as a mark of the Grand Canal World Heritage Site. It was one of the large national granaries along the Grand Canal. About 200 cellars have been discovered from the site, but it has been estimated that there could have been 700 cellars at the original granary. To my surprise the place was closed even though it was Tuesday one in the afternoon. The problem, as usual in China, is that you can't find any information about the opening times. But hey, I was in the core zone and I could see the circles on the ground through the fences! Maybe the experience couldn't have been remarkably better inside the fence. Grand Canal is a massive site like the Great Wall. To really understand it you have do some background research and to look a bigger picture, not just single places and details. Single short canal stretches could seem a bit underwhelming but all the networks of canals form very impressive whole. It really is an important achievement of engineering. I was pleased with my visit to Xun County Section of Wei Canal. The granaries seem to be curiosities that you just want to tick off although Liyang Granary could have some potential after the renovation. 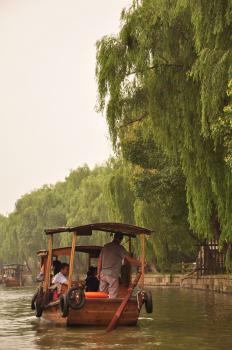 There are a couple of reasons to visit the Old Beijing City Section of the Tonghui Canal or (Shichahai). The area is quite scenic and is rich with history, though the Yinding Bridge area has become too commercialized (even in 2007) for my taste. Too many bars! The surrounding Hutongs alongside the Bell & Drum Towers (walking distance) are worthy of a couple hours exploration. This old section of Beijing is partly included in the Central Axis nomination and with the inscription of the Grand Canal, the rear lakes make this historic area of Beijing rewarding for any traveler. I vividly remember my time exploring the Hutongs, taking pictures in and around Yinding Bridge and Houhai Lake. Furthermore, I've tried (middling success) to retrace my journey in around Qinhai Lake, as well as the Former Yu Canal, which I believe the picture above captures. The Shichahai Lakes + the Hutongs + historic Bell & Drum Towers make this corner of Old Beijing worthwhile and my personal favorite area of Beijing to explore. While just one small part of the Grand Canal WHS, Schichahai was the northernmost terminus and was hugely important (particularly in the Ming Dynasty). China is a “different country” every few years – even back in 1989 it was already very different from my previous visit in 1978 but some aspects had not yet changed – in particular the road system was still very poor. We had seen the hints of things to come in the form of motorway construction but, for anyone wanting to get from Suzhou to Hangzhou the 12 hour overnight boat journey along the Grand Canal was still a reasonable way to go. Today (2014) the motorway journey takes around 2 hours to cover the c 170kms and only tourists would want to take the canal route – which does indeed still seem to be available! We had already seen the teeming life of the canal during our cycle tours around Suzhou and it was great to get in amongst it all on the boat. Our boat was packed with passengers and we had to grab a couple of bunks from the hundreds on a lower deck. The overnight schedule meant that a lot of the trip was in the dark but I remember well the evening and morning views. My attached photo, scanned from a diapositive and taken as we left Suzhou, captures well the almost continuous “traffic jam” of cargo boats, often in the form of great “snakes” of barges loaded to the gunwales with bricks, gravel, coal etc and sacks of unknown contents! It appears that China’s investment in road and rail across the intervening years has in no way reduced the use of the canal as an important means of transporting bulk goods. If you are in the area and have an overnight to “spare” it could still be an interesting journey as an alternative to yet another motorway trip! Nowhere in China can show the importance of influence in socio-economics and culture of the ancient engineering marvel of the Grand Canal than the prosperous Jiangnan Region. 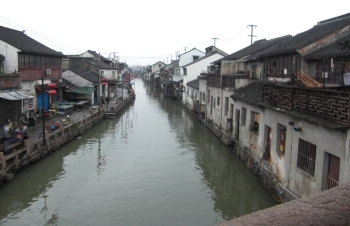 During my Jiangnan visit in 2011, I crisscrossed the Grand Canal and its branches many times; I saw many beautiful water towns such as Wuzhen and Zhouzhuang, however for the best part of the Grand Canal itself was in Suzhou and Yangzhou areas, the two cities that embraced the canal and became trading hub as well as cultural center. While the highlight of Suzhou is the famous classical gardens, the city old town of Pingjiang District is equally interesting with beautiful Jiangnan vernacular houses, the style that quite similar with the Huizhou style of World Heritage Site of Xidi and Hongcun villages, small canals, stone ached bridges, and rows of weeping willow tree, a very classic image of charming Chinese water towns. Pingjiang is also the last vestiges of old Suzhou that still perfectly preserves its old area with few modern revival old styled buildings, so to be listed as World Heritage Site, for me is the good act and final completion to preserve Suzhou as one of the most beautiful city in China. Pan Men Gate is another nominated scenic area in southwest corner of old Suzhou, the main attraction here is the fine old city gate and beautiful Ruiguang Pagoda in the nice landscape garden. However to be honest there was nothing much to see and I spent the majority of my time looking passing boats on the canal and old Chinese men playing mahjong in the park. Yangzhou is quite similar to Hangzhou at the quick glance. The main attraction is the beautiful Slender West Lake; actually it is not a lake but a wider canal area. Along the lake reminded me to beautiful Hangzhou's West Lake with beautiful lakeside pavilions, arched bridges, thousands of weeping willow trees, Tibetan stupa and all elements of perfect Chinese gardens landscape. The biggest contrast between West Lake and Slender West Lake is the lake shape, because of narrower channel; it is easier to appreciate all structures along the lake in both sides in the one ride. Also because of smaller water area, bridges in Slender West Lake are easier to have more elaborated design than those bridges in Hangzhou. Anyway apart from Slender West Lake area, Yangzhou is unable to preserve large area of old styled architectures like Suzhou can. Along the Erdao River, which was one the main city waterway, is now full with modern but nice housings. I also impressed with Yangzhou's culinary heritage, Huaiyang Cuisine, one of the four celebrated cooking styles of China, the other are Cantonese, Sichuan and Shandong. The Grand Canal plays important role on Huaiyang Cuisine development as the place of mix and match of northern and southern cooking style. I have to admit that eating in Yangzhou was one of the best meals I had in China (my favorite Chinese cooking style is Cantonese in Hong Kong and Guangdong). Although the outstanding value of the Grand Canal is unquestionable, I am a bit skeptical of site selection by Chinese authorities. It seemed to me that the Chinese compromised Suzhou and Yangzhou's political rivalry quest to be World Heritage Site by combining both Yangzhou and Suzhou extension under the single umbrella of Grand Canal. Strangely that while decided to combine Yangzhou and Suzhou; the Chinese explicitly excluded other well known canal towns along many Grand Canal secondary branch and shortcut which currently under the tentative site called Ancient Venetian Township in the south of Yangtze River especially for the case of Wuzhen and Nanxun which are located on important shortcut canal bypassing Jiaxing to Hangzhou. I presumed that if the Chinese let both Yangzhou and Suzhou go on, both nominations will be each other problem on comparative study, and if they decided to include Wuzhen and Nanxun in the nomination, it may cause future obstacle to other sites like Lizhi and Xitang. In my opinion, Grand Canal is not only the sophisticating World Heritage Site, but also a very sophisticating in term of tactic on planning World Heritage Site nomination. It looks like this site may be China's proposal in 2014. As such I decided I could attempt to get in a pre-emptive strike at what I hope may be part of the inscription. I visited the new Grand Canal park in the town of Tongzhou which is essentially a suburb of Beijing. It is here that the massive Grand Canal had its northern terminus, before goods were offloaded to be taken into Beijing proper. It seems a lot of money has been spent on making the park into a nice recreation area, and some of the local bridges are also being restored. The park has some nice touches, especially a sculpture on the ground that recreates the course of the canal and shows scenes from its illustrious history. However whilst I was there is just felt pretty windblown and desolate, the only people there were a group of school children, an elderly man flying a kite and one western tourist trying hard to fight off jet lag. It was nice to be there though and it was interesting in an everyday off the beaten track kind of way. I can't say I have seen the best of this massive feat of engineering, but the girth of the canal was impressive. My hopes of getting onto the water were scuppered, there were no pleasure boats sailing (despite internet sources suggesting there were), the floating restaurant was closed and looking derelict and it was too windy for me even to venture out on the pedalo (at least I think that is what the bemused attendant was try to explain to me). 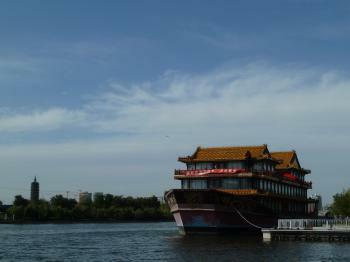 Houhai lake in central Beijing was part of the canal system but I am not sure if it is part of the proposal. I went there in anticipation of some nice relaxed bars around the shore line however it seems that it has had massive investment in the last few years, and it appears it is being turned into a kind of over the top tourist resort with identikit neon bars, it wasn't really to my taste. But as with many new projects in Beijing it seems that the authorities know what mass tourism wants and here they seem to be combining it with a still being constructed night market. If you are on the hunt for some laid back bars then I would recommend walking about 5 minutes further on to the area around the Drum and Bell towers, where the atmosphere was much nicer. Perhaps venturing out to Tongzhou is not the best way to see the site, but it was an interesting excursion form the usual tourist routes of Beijing, it Houhai lake is to be included then you need not venture too far to pick up a new WHS should it be inscribed. I love this ancient wonder still in use. the most impressive one is in Hangzhou, the southern point of the canal~ river cruise, historic buildings, local restaurants and tea houses, museums along the canal (they are best museums in China, not large in size, but focus on local topics, like pottery, sword, scissor, and of course, canal), art galleries, as well as the night sightseeing. It's just awesome!! 2.5: Ian Cade Antonio J. YAO WEI Svein Heltberg Peter A.